You have probably heard this term more than once in your business or nonprofit. Customer Lifetime Value (CLV) is an easily understood measure of what a customer is worth to a business. Simply, it answers the question of, how much will a given customer spend with us over the life of our relationship? It can be measured both online and in real life, and it applies to both business-to-consumer and business-to-business settings. If you know CLV, and you know the cost to acquire a customer, you can make individual and aggregate calculations that tell you the return on investment (ROI) for lead generation marketing and the selling activities of your business (or donor acquisition for your nonprofit). Quantity measures of CLV, however, leave out the considerable value of the quality of relationships you forge with your customers. A complete view, one supported with the communication you maintain with your customer base, should find additional ways to measure CLV, so you and your colleagues can go by more than the numbers. There should be a relationship between the dollar-value of a relationship, and what that customer can do for you that cannot be measured on your bottom line. The value that can be ascribed to your relationship with a top customer may be as much philosophical as financial. Increasing utilization, and upselling and cross-selling will get you more payments, but as you near the top of that curve, how do you continue to increase value from the customers who buy from you regularly and presumably are happy with you? 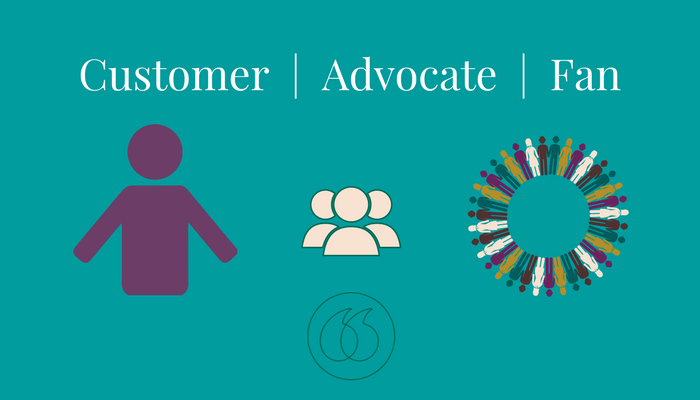 To turn existing customers into your biggest advocates or brand “fans,” consider how they behave today. Where are they on the spectrum of customer to fandom? After they’ve purchased what they can, how else can they bring value to your business? Customers with highest dollar-value CLV may help you by completing surveys or participating in focus groups. Especially in B2B commerce, you may build deeper relationships and flatter them by asking them to serve on customer panels to give you feedback on a single initiative or as a regular participant in a customer advisory council. In B2C, best customers can become leaders in online communities – they will take them over, nurture them, and make them stronger. They will post material on your behalf, defend you, sing your praises, and they will write your good Yelp reviews or wherever else it might be appropriate for them to weigh in and demonstrate that they know your brand, like your brand, and trust your brand. A true fan trusts your brand implicitly. These are the customers who are most likely to forgive you any “bugs” or foibles if you stumble with Version 1.0 of your new product. If they feel your value as a company, they’ll be your early-market buyers and defenders when you come out with something new, trusting that you will recover and course-correct in no time. Perhaps the magic of human connection (how we at 3C Comms like to view marketing) really can be articulated, tested, reproduced, and scaled down to a singular formula with a simple mathematical algorithm. But the foundation, as with any type of sales enablement or attempt to influence decision-making, must begin with building a relationship. That truth is timeless. We believe the following truths are as well. "At the start of the 2000’s, digital video recorders were brand new to the market, and looked like minor miracles to those of us used to swapping out VHS tapes or rewritable CD’s to record favorite television shows. The old way was clunky, risked recording the latest episode of CSI or Survivor over Grandpa Frank’s 75th birthday if you weren’t careful. "I researched the market and discovered TiVo. And to get the most out of my brand-new DVR I found an online community of fans who traded tips, tricks, and hacks. All business at first, we eventually shared info on favorite shows to record, and then went way beyond TV to share news of trips, family, work, food – life. "In Silicon Valley, where I was living at the time, there was a strong TiVo community – lots of engineers and tech-happy business types – and we decided that we needed to get together in real life just for fun. We planned a weekend picnic, and because one member of the group had worked on a project to bring audio-visual equipment into children’s hospitals, we made it a fundraiser to purchase TiVo DVR’s for their a/v rooms. "While each of us may have purchased one or two TiVo units for our homes, we amplified the new technology and its strongest brand by becoming its strongest advocates, actually purchasing additional units to give away, and by raising awareness of the TiVo brand by exposing hundreds of families to it, from medical and support staff to the families of children undergoing treatment. What’s that kind of PR like for a brand? "Now sometimes when I watch a favorite show I like to sip a Scotch Whisky, neat if you please. Over the years I've bought more Laphroaig Scotch Whisky than any other brand, by a wide margin. I love its strong peaty taste and the near-medicinal aroma, and I like how they treat me as a fan. "With each bottle, Laphroaig includes an offer to become a Friend of Laphroaig, claiming a square foot of the peat bogs of Scotland’s Islay region that give the whisky its distinctive flavor. It’s an endearing fiction, but I now “own” a tiny piece of the distillery’s land. Someday, when I make a pilgrimage to the distillery, they will give me a map to find my plot, loan me a pair of Wellington boots so I can slosh through the bog to see it, and a “wee dram” to carry with me so that I can drink to my little piece of land while I am visiting it. "Here in the States, they also offer invitation-only tastings and Scotch-themed adventures. I've attended a few of them over the last 5 to 7 years – from a fishing trip to a “kilt walk (no pictures, sorry!). I get to try new expressions from the distillery before anyone else, or I get to try things here in the States that are generally only for sale in international markets. It’s a way of introducing them to us to get a sense of whether fans of the brand will like them or not, and perhaps the outcome will be that the distillery and its spirited alchemists introduce them to the US market. "Find me walking the dogs on a gray and drizzly Seattle day, and you have a good chance of finding me in one of my Laphroaig hats or a scarf I’ve received at these events. I’ve convinced bar owners to keep it on their shelves, encouraged other Scotch fans to try it and made a few 'conversions,' and I’ve purchased bottles not just for my home but as gifts for friends. My CLV to Laphroaig goes well beyond my own purchases. "And now you may decide to give it a try. Neat, rocks, or poured from a Wellington boot, I’m a fan for life." If you’re interested in exploring the non-financial aspect of Customer Lifetime Value in more detail or want to learn how 3C can help amplify those metrics with professional communication services, drop us a line!